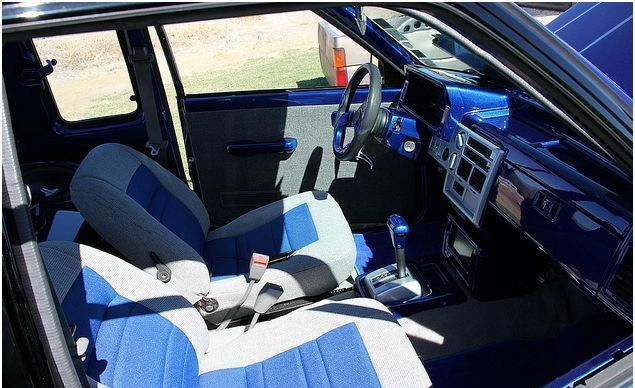 Interior: New carpet, the seats and door panels have been recovered, and everything else was painted. Exterior: Shaved all the typical stuff and then got rid of the top body line. Molded and painted the taillights in. New chrome grill and bumper. Before paint, 4 gallons of primer was applied. Engine: Re-ringed and redone head with a Weber carburetor and Pacesetter heads. Motor and transmission painted body color. Still retained the heat and a/c. Suspension: AccuAir e-Level, Slam bags GC manifold, Hardlined airlines, Kustomwerks control arms front and rear. Toy drop spindles and front suspension, rear is Ford IRS from a Super Coupe. 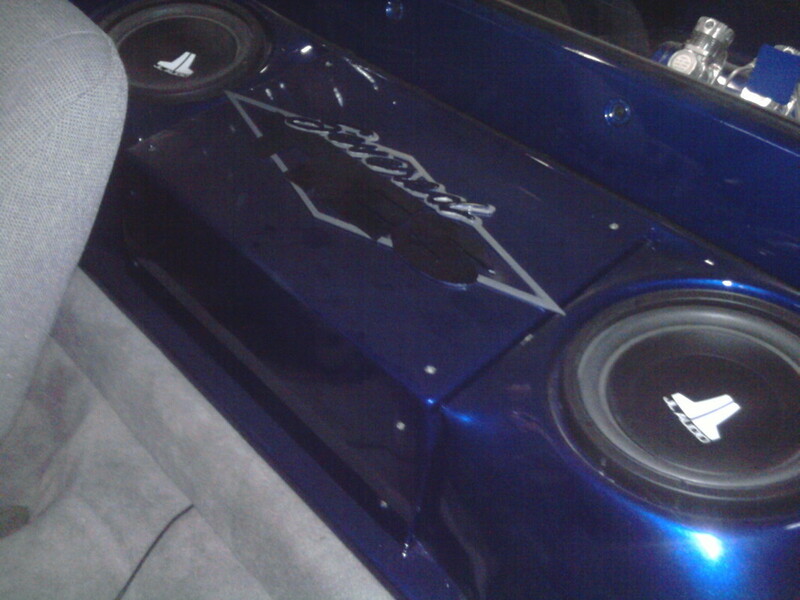 Audio: Kenwood DVD deck, JL 10â€ Subs and Amp. Work performed by/Location: 90% by me at home and work. Thanks from owner: To my wife for putting up with me when working on my truck so much and spending all the money on it. To the Idaho chapter of Severed TIES for all their help and support. Finally, to my boss for letting me work on the truck and use the shop to do a lot of the work. How long have you owned this truck? Since the middle of 2009. Is there any unique stories or history behind this truck? 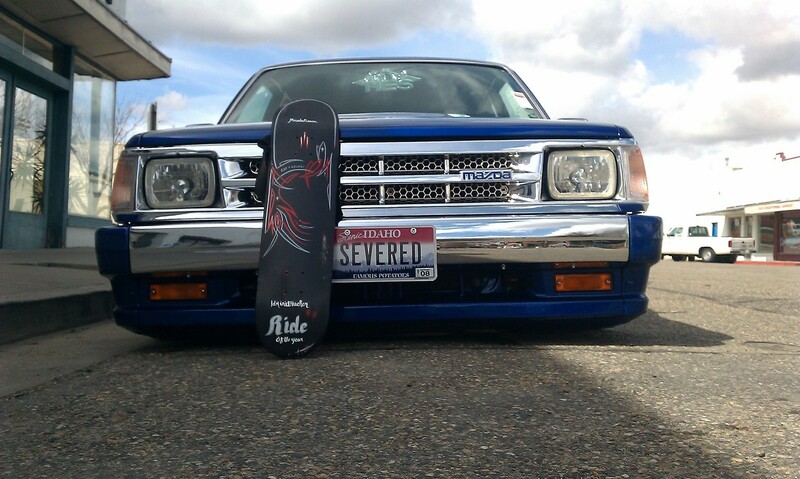 The frame was built in Tennessee by Negative Camber and then shipped to Idaho to a Relaxed Atmosphere member and then I ended up with it in Severed TIES. Did you consider any other projects before starting this one? Had a couple other Mazdas and even a Honda Civic SI. Who helped you build it? My wife did a lot of the little tedious sanding under the truck and in the jambs and I had help from the club and some other friends to get it finished. What makes your truck unique from other ones? It probably has a lot more paint work then a lot of trucks. Pretty much everything on it is painted to match the body color or the silver accent color, the only thing left to paint is the bottom of the bed. What feature do you like most? That it's almost done, and the fact that most people don't notice the top body line is shaved. What don&#039;t you like about it or if you could go back and change something what would it be? The rear end isn't set up with the greatest geometry but it will get changed in the future. What was your biggest obstacle and how did you overcome it? Same as everyone else,. MONEY!. But I just worked at it and got it done. If there was not limitation on money, what singe modification would you choose? I did everything I wanted. What does your friends and family say about this truck? Everyone is pretty supportive, most all of them like it, well at least that's what they say to my face anyhow. Any memorable moments with it? It's been fun taking it to the shows and taking home some bigger awards. It took 3rd in MiniTruck Wild at Sittin Pretti and 2nd in Wild at West Coast Nationals. The only two other trucks in my class that beat me were Patrick Rios Nissan hard body cover truck from Mini Truckin (he took first) and Uncle Fester's Too Slow and he won Best of Show. Among that competition is was a really good feeling. What are your future plans for this truck? It's a secret as of right now. But there will be some changes next winter. 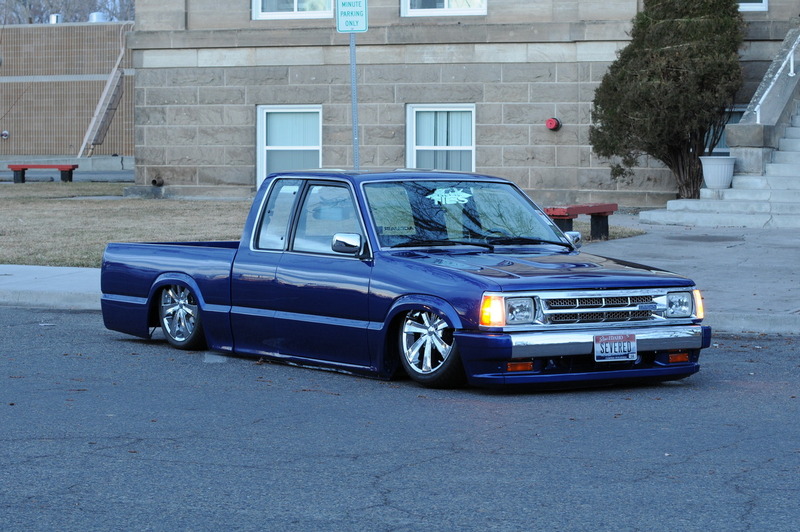 Have you been into customizing trucks for a long time or is it more of a new hobby for you? Ha that's great! So how did you come across this website? I spent a lot of time on SSM but there is too much drama over there and someone said something about it and I jumped ship. I still look around over there but don't post very much. I think the only detour from Mazdas was a 2000 Civic SI that was kind of riced out...but thats long since gone. I think a lot of guys have been on SSM at some point...we have always tried to create a community that helps each other here on our sites. Have you made any connections with people on the site that have really helped you build your truck? I got a few parts from people and some ideas. But I did 90% of the work myself. I got the frame from someone in Boise but it was built by john (laynrockers on here) in TN and shipped up here. But it had been outside so it was rusted bad and need some modifications done to work for me. And I had some help for about a week with some of the body mods and body work but I finished them and did all the paint work on the truck. Also I can't sow so I had someone do the seats. I love hearing about how connected people become when building a show truck like yours. 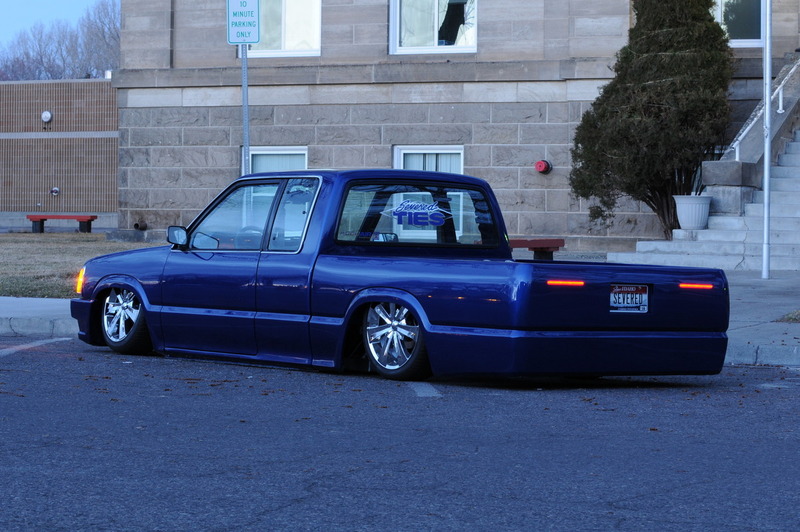 It can take so much input of others to really make a truck stand out and you have definitely done that! You were at a show this past weekend right? How did that go? Yeah it was a hotrod show called The Boise Roadster show. My truck was the first mini-truck in over 10 years in the show. It was a whole lot more work then I would have expected. Indoor shows are not near as much fun as outdoor ones. As for how I did, I took first in my class, but since that was pre 88 mini-truck and I was the only mini-truck in the show I kind of expected that. However... after I walked back to my buddys booth where my wife was we were talking and the next thing we know is I hear them say 86 Mazda, and it was for OUTSTANDING ENGINEERED for the whole show. It was a pretty big award at that show which really blew me away. Wow yeah, that is a great accomplishment for sure. I think engineering is undervalued, people don't realize how much math and engineering that goes into building a show truck. Do you like to attend a lot of shows? How far have you traveled? And who usually goes with you? I like to go to as many shows as I can. I don't drive the Mazda lol (it has less than 400 miles after a year of shows) so I have to tow it and with diesel already over $4.20 a gallon here that will hurt this year. The farthest we went last year was WCN about 1800 miles round trip. I had planned to take it to Tex-Mex this year but since it is a Severed Ties show and it wouldn't count for much other than to have it there and the price of diesel I decided against it. My wife goes to a bunch of them and we take our 7 year old son to as many as we can. I towed the Mazda around 7000 miles last year taking it to shows. Well that puts into perspective...you travel well! That's really cool you do it with your family, I am hearing that more and more in this community are trying to get back to that. So tell us a little bit about Severed Ties...how did you get connected with them and what is current involvement with the club? I met the local guys at DropZone in OR in 2005 and just started hanging out. It just kind of grew from there. I petitioned the club towards the end of 2007 and was a full member in May of 2008 so all most three years now. Right now I'm the secretary of our chapter... I basically just make sure we have a meeting scheduled each month and keep us as a chapter on track for show dates. Ok that's cool...so you are from Mt. Home Idaho - Is there much going on with local shows or do you just meet up with guys from the ST chapter in Idaho? There's a couple small hotrod type shows in Mt. Home but there are a couple mini-truck shows in Boise and then a lot more hotrod shows. I try to make it to every show that I can, last year was the first year my truck was really out at the shows. The interior wasn't even finished until Sittin Pretti in August so this summer will be the first with a &quot;done&quot; truck. But it did really well at the shows last year. Oh ok, so 2011 is looking to be a big year for you! Thanks I hope they don't go to high. I hate missing fun shows LOL. Now that you won't be spending as much time building your truck how do you plan to use your time? Do you have any other hobbies or interests? I have been playing a lot of COD Black Ops with club members from around the country. There is a group of us that plays almost every night lol so it's a good way to stay in touch with friends I only see once or twice a year. Other than that I do a lot of shooting in the summer and just spending time with the family. Its fun but I only play when I have free time. I don't make time to play, I haven't been on for over a week because of the roadster show and then getting caught back up on everything else I was too busy to do because of the show. Anyone seeing your truck has to notice the attention to the body work you have done...how long have you been a body man? Did you go to school or did you pick it up over time? I started by helping one of my friends out at his work and his dad owned the shop (that was in 2000). I was a welder before that. We built a few things and then a job opened at their shop in 2004. I ended up getting it and learning as I went. I had a couple guys with 20 plus years experience show me a lot of things and it just went from there. I had no formal training when I started but now I am an ASE master Tech and Platinum I-car certified. I am also a master PPG painter. I found it pretty easy to learn hands on, plus welding is a big part of it and I can pretty much weld anything. So do you enjoy your job and the company you work for? And do you have a dream job you would like to get to one day? I enjoy fixing cars and the shop I work at is great. I mean where else can you put your car in the shop and work on it and use all the tools around lol. I basically built my truck at work. The only downside to my job is insurance companies and playing some of the games to get them to pay to fix the cars right. Some are good some are bad. Other than being independently wealthy I think I have my dream job. Hearing people working a job that they are passionate about just pumps me up about life. That's great to hear! Thanks for all the votes and glad everyone likes the truck as much as I do. Hopefully everyone can see the truck in person one day. This blog has been viewed 16771 times. Thats awesome! 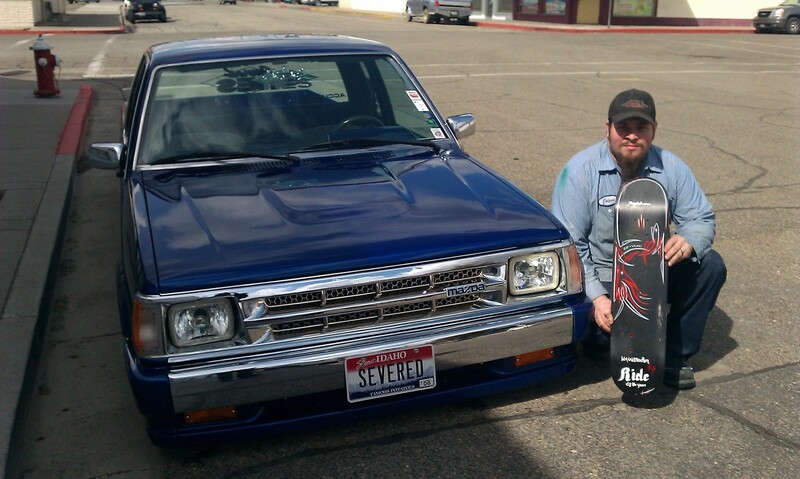 Great story and a sweet truck! Congrats to idminitrucker! Thanks! Im at lunch so I didnt get to read the whole thing but I will when i get home. Damnit lol if i get a vote can i stay blue... or a different shade of blue. And thanks for the write up it all looks great! No way man ITS PINK sorry brutha!!! !